But in reality, this is just a marketing toy built under the direction of Vespa South Africa’s marketing director Andy Reid. Reid was the guy who came up with the idea to place fake parking tickets on legally parked cars for driving difficult-to-park, fuel-guzzling motor vehicles instead of scooters. I thought it was an abomination the first time I looked at it, but the more I gawk, the more I want to give it a spin. Thanks to Ilya for the scoop! 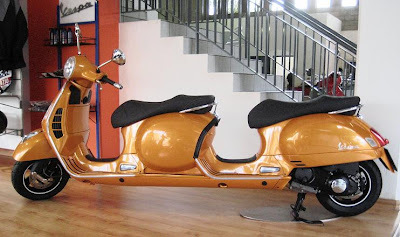 Wow, that would be a hoot to have out on New Year's Eve…a Vespa Limo or sorts. Just needs a roof like the C1! Wow, I'be seen pics of a whole Vietnamese of 6 on one scooter, just think how many they could get on this thing!